5000 ducks float down the river! First adopted duck to cross the finish line wins!! Watch the action from Ellison Park. A total of $10,000 in cash prizes to be given out based on donations received. DON’T FORGET TO ADOPT A DUCK AND HAVE A CHANCE TO WIN! Also available at American Legion, Chamber of Commerce, Monticello Times Office, Metro PCS, Monticello Goodyear, and Premier Bank during regular business hours. Adopt your ducks during June and July through Riverfest weekend! Ducks available for adoption at all official Riverfest-related activities* and Lions Club events. Riverfest Activities: Walk & Roll, Downtown Block Party, Community Center Block Party, Thursday at Pioneer Park, Art in the Park, Beanbag Tourney, Street Dance, and Sunday at Ellison Park. 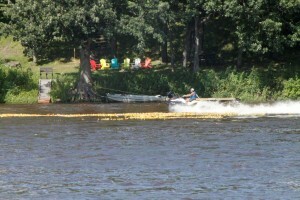 Duck Race Winners will be posted on the Riverfest Wrap-up page after winners are announced.